Fill the appropriate details under the new application section including the programme you intend to apply for. (Ensure you provide a valid and personal telephone and e-mail address as this would be used to track your application). After filling the details, a one-time authentication code would be sent to the e-mail address provided INSTANTLY, login to the email account and copy the authentication code sent to you. Paste/Type the authentication code in the Activation box provided to validate your details. The system will take you to APPLICATION FEE PAYMENT PROFILE. Click on MAKE PAYMENT and wait while the system redirects you to the payment portal platform where you would provide your ATM Card details such as; CARD NUMBER (the number written infront of your ATM Card), Cvvs number (the 3 digits number written at the back your ATM Card), the Name on the ATM Card and also select the card expiration dates. After all these Click OK. Please wait while the system redirects to your bank’s portal to validate the authenticity of your ATM Card, by generating OTP number for you to confirm the payment. After Step 10 above, a Form Number would be generated for you and subsequently sent to your email address. From your dashboard fill your application form and provide all details as required before submitting. Ensure you tick the checkbox on the Application confirmation page before submitting as failure to do so would keep your form open preventing your application from being considered for admission. 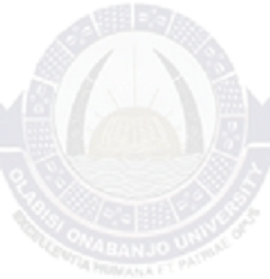 Thereafter, print a copy of the Application form and bring alongside with copies of your credentials to the Centre Secretary, Centre for Continuing Education Olabisi Onabanjo University, Ago Iwoye during the admission registration.